• The annual recurring financial implication on account of implementation of OROP at the current rate will be approximately Rs. 7500 crore. • The arrears from 01/07/2014 to 31/12/2015 would be approximately Rs. 10,900 crore. • 86 percent of the total expenditure on account of OROP will benefit the JCOs/ORs. • Payment of arrears and revision of pension under OROP is to be made by the Pension Disbursing Authorities in four installments, except for family pensioners and pensioners in receipt of gallantry awards who will be paid arrears in one installment. 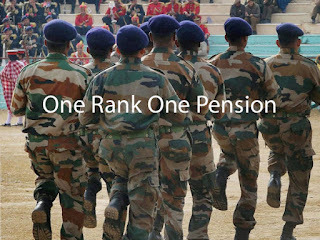 • The total increase in the Defence Budget for pensions is estimated to go up from Rs. 54,000 crore (BE 2015-16) to around Rs. 65,000 crore (proposed BE 2016-17), thereby increasing the Defence Pension Outlay by about 20 percent. The Union Cabinet chaired by the Prime Minister Shri Narendra Modi today gave its approval for creation of a supernumerary post in the rank of Air Marshal in Indian Air Force for a period of seventeen months from 01 December, 2014 to 30 April, 2016 for abiding by the Orders of Hon’ble Armed Forces Tribunal (Principal Bench), New Delhi. The creation of the supernumerary post isover and above its sanctioned strength of Air Marshals in the Aeronautical Engineering branch, to enable the Ministry to consider seeking approval of the Appointment Committee of the Cabinet on promotion of AVM Sanjay Sharma, in accordance with the proceedings of Review Special Promotion Board -2014 in compliance with the directions of the Hon'ble Armed Forces Tribunal (Principal Bench), New Delhi.